For the past 2 weeks we were on the road making our annual cross country trek to the Our Family in Africa Reunion. Our destination was Indiana and the home of Stori and Jamie Sullivan. Before I say anything else I have to say that these two people have the gift of hospitality like no one else you will ever meet. They are some of my dearest friends and such a HUGE blessing to my family. I'm going to do a separate blog post about the reunion with lots of pictures. But first, another crazy camping adventure story. So what is your greatest fear? Spiders, snakes, public speaking? Toddlers? Mine is completely irrational. I have a weird fear of falling off a cliff. Like you're driving along and suddenly the road gets so steep that your car flips over backwards. Or you're cruising along one of those windy mountain roads and your brakes or steering fail and you go flying over a guardrail down into a bottomless ravine. No, neither of those things happened on our trip. Brian has two major fears. Being struck by lightning or being bitten by a rabid bat. This will become important later in the story. So we started our road trip bright and early one morning, but not early enough to avoid Houston gridlock traffic. It takes forever to get out of the greater Houston area. Just as we had finally cleared the city and hit clear highway roads, our first hiccup. I guess I should have named this post "It's not an adventure until someone throws up!" We remembered to give Grace her Dramamine, but little did we know that we would have a second puker in the family. Manny threw up his McDonald's' biscuit all over himself, and then wet his pants. So we pulled into a truck stop, I stripped him down and re-dressed him in the only clothes I could easily get to in our over packed van, too small shorts and a jammie shirt. And then we were back on the road. Only to be stopped minutes later by some sort of hazardous material spill and a life flight helicopter on the highway. Three hours into our trip we were only 30 mi. North of downtown Houston. It felt like we were never going to get out of Texas!!! Public restrooms make my kids lose their minds! Does this happen to anyone else? But we did. We made it to our first campsite at Lake Catherine, Arkansas, just outside of Hot Springs. It was beautiful, had a great swimming beach and the kids loved it. We will definitely return to this campground the next time we are passing through Arkansas! The next day we packed back up and headed to the Land Between the Lakes in Kentucky. It was a pretty uneventful day until we stopped at a Walmart to pick up a few supplies that we had forgotten and our battery died on the van. Luckily it was a Walmart with an auto department. They came out and jumped our van, we drove it right into the shop and got a new battery. When we finally arrived at the campground it was already starting to get dark, but even so it was probably my favorite part of the trip. Our campsite was huge and had a great area for the kids to explore. The front gate was out of firewood so our evening activity was collecting wood from around the campsite. The kids had a blast with such a simple activity. It was like a wonderful scavenger hunt at our very own camping party! As we walked the campground the trees and shrubs started to fill with FIREFLIES!!!! The kids were so excited and I was too! There is something perfectly magical about kids and fireflies. Collecting wood for our fire. The next morning the kids took a nice long swim at a great beach and then we headed to the Sullivan's. Oh but first, this super nice lady that was staying in one of those mega million motor homes took a liking to my kids and brought us a pan of freshly baked brownies that morning. That was pretty cool. Louise is a water baby! I love those sandy brown toes. Manny was making "sand"wiches. Hee hee! Sometimes I crack myself up! The Sullivan's house is my happy place, but like I said I'm going to save that for a separate post. We stayed 5 days at the Sullivan's and then we started the long trek home. Amber Lehman suggested we get a hammock. It was a huge hit! We had decided that on the way home we would spend 2 nights at each campground instead of just one. Our first stop was Lake of the Ozarks in Missouri. It was probably the least nice of the campgrounds, but we met some very nice people there. It was kind of cloudy and cool the next day so we went and took a cave tour. Right about the time we were at the point of no return Louise decided she had to go potty. And it seems that Manny may be a bit claustrophobic. It wasn't the most fun I've ever had. This looks like a cliff, but it is just a small hill. No cliff diving in this family. The next day we headed to Beavers Bend State Park in Oklahoma. It was cloudy and drizzly all day so we were a little nervous about how the weather was going to effect our camping. When we finally arrived at our campsite it had clearly been raining all day long and our reserved spot was a great big puddle. It wasn't raining too hard but the prospect of being trapped in our muddy tent from 7 pm on didn't seem like a great option. We got lucky because the campground also rented some rustic cabins and they had one left! We went ahead and rented it for the night. It was very rustic and kind of expensive, but we were out of the rain, the kids were fed and by 9 pm we were all tucked into bed. Grace and I were the last to turn in. She and I took the bed and Brian was on the floor on an air mattress with Louise and JoJo. Kat, Manny, and Haven were in another bedroom. Everyone else was asleep. I was just drifting off when I heard a sort of strange noise. At first I thought it was just the house settling, or the AC turning on. I rolled over and Grace had heard it too. We both lay in the dark on our backs with a bit of lighting shining in from the bathroom and that's when we saw it. Flying around the room of our very low ceiling cabin. Banging into walls, flapping its creepy little bat wings. 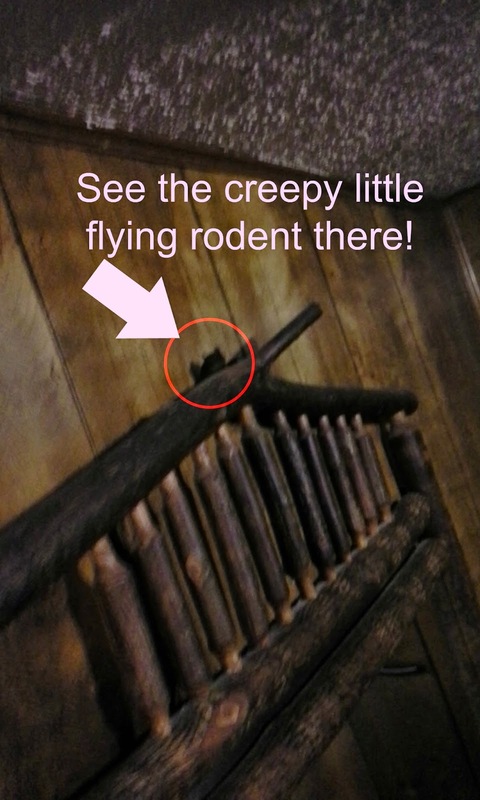 Just a few nights earlier I had been sort of making fun of Brian's fear of bats at the Sullivan's house. Now I was laying there sort of freaking out myself. I've never had an inherent fear of bats, but then again I've never had to sleep with one in my bedroom. I reached over the side of the bed. "Brian, don't panic, but there is a bat flying around the room." Then Brian did one of the bravest things ever. He got out of bed and turned on the light. And then ran out of the room. The bat continued to swirl around the ceiling and then it landed on the top of the dresser mirror and chilled for awhile. So now it is 10 pm and we are trapped in a house with a bat. So we do the only logical thing for city folks to do. We carefully and quietly packed up all the stuff we had lugged into the cabin, loaded our sleeping kids into their car seats, and evacuated the cabin as quickly as we could, all the while staying sort of ducked down in case the bat should start swooping again. The hardest part was getting the kids and the air mattress out of the room with the bat. Again, Brian was so brave. Had we been about to fall off a cliff, I don't know if I would have been so composed, but in the face of that bat, he was Super Dad! We drove down the road about 10 miles to the closest town and thankfully Oklahoma is a state with casinos, and therefore, plenty of hotel rooms. Part of the reason that we had decided to take up camping was because the occupancy rules usually don't allow all 8 of us in one room. So when the lady at the registration desk asked how many in our party, Brian said "It's just me, my wife, and our kids". Vague, but not a lie. I'm sure she was surprised when she saw so many of us parading by her desk. But she didn't fuss, she just asked if we were going to need more blankets. The next morning, after a very good nights sleep, it was still raining so we decided to just head home a day early. The bat incident had sort of taken the wind out of our sails and by now most of us had come down with a cold. And as you can see, I have no pictures of our time at Beavers Bend, except for the bat. So now we're home, most of the dirty laundry is caught up and the start of the school year is quickly approaching. Overall, I'd have to say that I mostly loved camping. I wish there was more time in our summer to a little bit more. The kids are so happy when they are running free, picking up sticks, rolling in the dirt. Unfortunately, weather is a real sticking point. Hot is sometimes just too hot for a tent. Rain, mud, and tents just don't mix. I found myself often on the trip home daydreaming of a little old used trailer for my family. Nothing fancy, just a place to sleep out of the rain, a place to sit and play cards when it's too hot to play outside. A little traveling home to call our own. With no bats allowed.